“THE MODERN WATCHMAKER’S SERVICE MANUAL” was a booklet reprinted from a series in the American Horologist & Jeweler (now the Horological Times) prepared for the WMJDA (Watch Material and Jewelry Distributors Association, now called the JIDA for the Jewelry Industry Distributors Association by Robert F. Kilb. This booklet is not dated and I will find out later when it was done. By the names of some of the companies still in business my best guess is this was written over 30 years ago. I happen to know Robert F. Kilb who is about 30 years older than me. Mr. Kilb who retired a few years ago was about the most gentle and kind man in the industry. For him to write about these issues and the way he does is a serious matter. But, the truth is 30 to 40 years ago when this booklet was written the parts industry was much different and easier place for all to do business, then the conditions today. I think every person at every level in this industry should read what Robert F. Kilb wrote. The watch repairperson, store owner, watch collector/hobbyist, the folks who now run the Swiss Watch Industry as well. Every American in this industry along with everyone who owns a watch should note that our elected US Senators and members of Congress write the laws that govern us and outline how business is conducted in the USA by all not some guy or gal in Switzerland. Okay, you heard me rant and rave some so I better get to Mr. Kilb’s series. Please keep in mind I will be testing you to see if you read this. As our “Sir Paulo” likes to say “work with us, not against us”. Editor's note: This month American Horologist and Jeweler is beginning a series of articles on the proper methods of ordering watch material. These articles have been compiled by the Educational Projects Committee of the Watch Material and Jewelry Distributors Association of America. This first article in the series does not deal with technical questions as such, but rather is an attempt by WMJDA to explain the background of the problem, and what it thinks can and should be done. Comments from readers are solicited as the series progresses, and it is hoped by WMJDA that a dialogue may be stimulated which will ultimately benefit the industry as a whole. Problems besetting the watch repair industry today are certainly plentiful. These exist at all levels of the industry with manufacturers, distributors of replacement parts, and with men at the bench. No one level can fulfill its function without the help of the others, nor can the problems of the industry be dealt with effectively except through cooperative effort, with each level giving others a helping hand. A watch material distributor is a "man in the middle" in this distribution chain, in a number of ways. He buys parts from the watch manufacturers and importers and resells them to the bench repairmen in his trading area. Thus he has a dual responsibility. For his repairmen customers he must maintain an inventory adequate for their needs, and a work force of knowledgeable people able to interpret these needs. For his suppliers he must, among other things, stock enough of their material to maintain good public relations for them in his trading area. From his position in the middle, the material distributor acts also as a liaison between the bench watchmaker and the manufacturer. In this function of go-between, the distributor listens to the problems of the watchmaker, most of which have to do with wage and price scales and the attitudes of employers and the public. He also listens to the problems of his suppliers, the theme of which is their inability to obtain employees capable of properly handling the tremendous amounts of detail in their businesses. Sympathize as he may, the wholesaler is relatively powerless to do much about these problems of the other two groups. There isn't a great deal he can do about watchmakers' wages, for example, or the attitude of the public toward a changing watch market, or manufacturers and importers' labor problems. Besides, he has a tremendous overriding problem of his own that he must pay attention to—a problem that he shares with the bench repairmen, and to a lesser extent, with the manufacturer. That problem is the efficient use of time. Progressive bench repairmen are keenly aware of the fact that efficient use of time spells the difference between a profitable and an unprofitable operation. Increasing use of ultrasonic cleaning machines, sophisticated watch timing equipment, automatic oilers, material encyclopedias, and cross-indexed material systems proves this. Money invested in these labor and cost-saving devices is paying big dividends to efficiency minded watchmakers. Yet there remains a time-related problem, which is a very real profit-eater for both repairmen and material distributors alike. To borrow a term from cost accounting, let us call it "down time," the time during which a piece of machinery is shut down due to mechanical failure, lack of work, labor troubles, or whatever. For a watchmaker, down time occurs when a part ordered from the wholesaler either does not arrive or is sent wrong. This can happen for a number of reasons . . . carelessness or lack of attention in writing he order, resulting either in misinterpretation by the wholesaler and the wrong part being sent, or the wholesaler having to write or more information before he can fill the order properly; lack of information from the manufacturer or importer which would enable the wholesaler to fill the order; carelessness on the part of the wholesale, resulting in the wrong material being sent. Let us discuss this last point for just a moment. It is extremely important that we lay our cards on the table and own up to the fact that material houses do make mistakes, and these mistakes cost watchmakers money in terms of down time. There is absolutely nothing to be gained by trying to paint ourselves lilywhite and shift the burden of responsibility completely onto the watchmaker's shoulders. We are human beings dealing with other human beings, and as such perfection is impossible. We must, however, not give up trying, and it is the responsibility of every material department head to investigate customer complaints, determine who was in error, and if it was the fault of the material house, find out why the mistake was made, and how it can be avoided in the future. Regardless of the reasons why material may be sent wrong or back ordered, the result is the same, down time for the watchmaker, a disruption of the profit generating routine. This is not good for watchmakers, and it is not good for material distributors. A distributor has very urgent reasons for wanting to see that as many orders as possible are filled correctly the first time. It is axiomatic in the industry that whenever an item is exchanged, or a letter has to be written, or a phone call placed requesting more information, an automatic loss is incurred on that order. Therefore it should be obvious that elimination of down time is in the interests of both watchmakers and material wholesalers alike, and both must put forth an honest and unremitting effort to make a dent in the problem. What do we propose to do? We propose to present a discussion of suggested ordering techniques, which, if applied, will reduce down time at the bench, make you easier to live with, and perhaps put more money in your pocket. Both approach and language of these articles will be down-to-earth intended to impart useful information, not bowl you over with a maze of technical jargon. If the articles are well received, and watchmakers across the country tell us they are worth reprinting in booklet form, we shall attempt to do this. We realize, of course, that we cannot undo the habits of years overnight, but neither can we sit idly by and allow the situation to worsen. We have used words to damn these problems long enough. Now we propose to use them to light a candle. BY FAR THE MOST pressing problem encountered by your WMJDA wholesaler in filling watch material orders is the apparent lack of understanding by many watchmakers of the difference between case material and movement material. Our starting point in any discussion of case material must be the realization that the movement makes up only half of the completed watch. The other half is the case and case components. During the production life of a particular movement model, the watch manufacturer or importer may choose to case this movement in many different styles, types, and qualities of cases, and for the most part this case material must be ordered without reference to the model number of the movement. The following parts fall strictly within the category of case material, and your WMJDA wholesaler cannot supply them by movement model number alone: crowns, hands, crystals, gaskets, two piece stems and case clamps. Almost daily your WMJDA wholesaler must cope with orders like these; stem and crown for AS 1187, 1 pair yellow hands ETA 1256, case clamp Omega 28.10, or 14 dozen gaskets AS 1240. Because your WMJDA wholesaler cannot possibly fill these orders by movement model number alone, he has no choice but to communicate with his customer by letter or telephone to request more information. The watchmaker is understandably irritated by down time on the particular job, and the wholesaler, as explained in the introductory article in this series, incurs an automatic loss on each material order where he must write or phone for more information. Because his business depends on repeat orders from a relatively limited number of customers, your WMJDA wholesaler has no choice but to accept an occasional loss order as the price of keeping his customers' goodwill. He shares this situation with the watchmaker, who frequently finds himself doing "loss work" for himself or his employer, in hopes of making a profit on the customer later on. Both watchmakers and material wholesalers must realize, however, that as businessmen they must cut these losses to an absolute minimum, lest they eventually find themselves winning the popularity con-test but not making any money. Regarding the categories of case components listed above, we will go into great detail on each of these in subsequent articles. The main message your WMJDA wholesaler wants to convey in this article is to make you, the watchmaker, aware of the difference between case material and movement material. Down time is costly for both you and him, but in most instances it is avoidable. A good habit to get into would be to ask yourself as you are writing out an order, "Is this case material or movement material?" If it's case material, don't order by movement model number alone. Some watch manufacturers have provided comprehensive case material systems keyed to the case numbers of their watches. These systems are time and irritation savers for both watchmakers and material wholesalers alike. It should be pointed out, however, that some of these systems are more comprehensive than others, and none is completely up-to-date on furnishing case number data for brand new models. This means that even the conscientious watchmaker who follows the suggestions in these articles to the letter will occasionally be disappointed when he finds that his WMJDA wholesaler has not yet received information on a very recent case number. In short, we may compare the case number system to democracy-it has its drawbacks-but it's still the best idea anybody has come up with to date. To guide the watchmaker in determining the scope of the various case number systems, we have prepared the following chart, which may be used as a rough guide. IN LAST MONTH'S ARTICLE we discussed the differences between case material and movement material, and how important is not to order case material by movement model number alone. We also touched briefly on factory case code number systems, their benefits and their limitations. This month we should like to talk about crowns, next to crystals probably the most frequently replaced case component. Broadly speaking, crowns fall into two major categories, genuine and non-genuine. Many watches will not function properly without genuine factory replacement crowns. Others will, but it is always the best policy to fit a genuine crown if it is available. Most WMJDA wholesalers stock genuine crowns for the following watches: Benrus, Bulova, Elgin, Gruen, Hamilton, Longines, LeCoultre, Mido, Omega, Rolex, Seiko, Wittnauer, and Wyler. Recheck the chart in last month's article for crowns that may be ordered by case number and color. For all others, the ordering procedure is essentially the same as for non-genuine crowns. The most efficient and profitable method of fitting crowns is, of course, to have a comprehensive selection at your fingertips at all times. Whether you stock crowns in depth, or prefer to order them as a specific need arises, the following descriptive criteria will aid you in making your requirements known to your WMJDA wholesaler: Outside diameter; Tap; Style; Color; Opening diameter; and Post lengths. The following is a more detailed discussion of these criteria, and how they may be determined. Outside diameter: Use your sliding vernier gauge to make this measurement, read-g to I/10th millimeter. If the old crown is still on the watch, measure it and allow few tenths of a millimeter extra if it is idly worn. If the old crown is missing, use your sliding gauge to determine the proper outside diameter of crown for the particular type of case. Watchmakers in-rested in learning more about crowns and the importance of fitting them properly are urged to read Henry B. Fried's "Watch Crown Manual." This book is available from your WMJDA wholesaler, and is well worth your time. If the side of the case is recessed, simply measure the diameter of the recess and deduct a few tenths of a millimeter for crown clearance. Tap: Use your sliding gauge, or better yet a dial gauge calibrated to I/100th milli-meter to determine the tap of a stem. Measure major diameter of threads and refer to chart for tap size. Nothing mysterious about it. To determine tap of crown, use crown gauge designed for this purpose, or screw crown onto stem of known tap size. Style: Most crowns fall into one of three major groups: regular, water-resistant, or dustproof. Within these major groups several shapes are available, e.g. domed, straight wall, bevel-bottom, antique, round, etc. Color: Specify yellow, white, stainless steel, chrome, pink, etc. Opening diameter: For waterproof crowns, the diameter of the opening or recess is identical to the outside diameter of the pendant post. Use your sliding vernier gauge to determine this O.D. reading to I/10th millimeter. For non-waterproof cases with pendant posts, choose crown with recess .50 mm to 1.00 mm larger than O.D. of pendant post. Post length: This refers to the post of the crown as distinguished from the pendant post, which is part of the case. Most common lengths are referred to simply as flush, medium, and long. Crowns for Hamilton "CLD" models: When ordering crowns for Hamilton "CLD" models, give the name of the watch in the case (Steeldon, Nordon, Haddon, etc.). This is sufficient information for your WMJDA wholesaler to fill the order properly. Pocket watch crowns: These are especially troublesome, due primarily to a steadily diminishing availability o£ replacement crowns. It is no longer economically feasible for the crown manufacturers to produce the huge variety of pocket watch crowns they once did, due both to declining overall demand, and skyrocketing production costs per unit. There has been a certain resurgence of demand recently with the popularity of pocket watches (especially the smaller hunting case varieties) as collector’s items, but manufacturers' and wholesalers' stocks of replacement crowns are practically exhausted. It is sad hut true that owners of fine pocket watches will find it increasingly difficult, and often impossible, to fine proper replacement crowns for these time pieces. While the suggestions outlined above for ordering other crowns apply also to pocket watch crowns, it is always advisable to send the sample crown (if you have it), the case ring, the stem, and the sleeve. If your WMJDA wholesaler is forced to substitute, it will be much easier to select a crown from stock if he has all the necessary components at his fingertips. A word about sleeves and pendant set stems: These parts are also becoming well nigh impossible to obtain. Order sleeves and/or pendant set stems first by sample, but if the particular one you need is no longer available, your WMJDA wholesaler will ask you to send the crown, case ring, and watch movement, as well as the stem and sleeve. The wholesaler may be able to supply a slightly different stem sleeve combination, but he may also have to supply a new crown if the new stem has a different tap. Deuber-Hampden stems and sleeves: These have been virtually extinct for many years (the Hampden Watch Company went out of business in 1930). Send the case and movement (movement removed from case, please) to your WMJDA wholesaler for possible retapping of the pendant and fitting of a conventional stem and sleeve arrangement. After coordinating all of the above factors (it only takes a few seconds in actual practice), refer to your crown assortment to see whether you have the needed crown in stock. If not, refer to the crown section of your material encyclopedia and order the crown from your WMJDA wholesaler by master system number, refill number, and color. If the encyclopedia does not list a crown which matches the dimensions you need, send the dimensions and description to your WMJDA wholesaler and he will either supply a crown as close as possible, or else try to obtain one for you on special order. LAST MONTH'S ARTICLE concerned crowns and proper ordering procedures. This month we will discuss the ordering of watch hands. The proper ordering of watch hands seems to be shrouded in mystery for many watchmakers. There should be nothing mysterious about it, however, if one realizes first of all that hands are case material, and thus cannot be ordered by movement caliber alone. The following information is absolutely essential it your WMJDA wholesaler is to properly fill any order of watch hands, regardless of the make of watch: hour and minute-hole size; make and caliber of movement; dial diameter; style of hand; color; and plain or radium. Hour and Minute Hole Size: The best way to determine hole size is to measure the diameter of the hour wheel and cannon pinion with a dial gauge or micrometer to I/100th millimeter. However, a reasonably accurate reading can be taken with the sliding gauge reading to I/10th millimeter on the vernier scale. Specify diameter of fourth wheel pinion or sweep second pinion, if second or sweep second hand is desired. An alternative method of gauging hands is the hand hole-size gauge illustrated on this page, hut, of course, it is useless where the hands have either been lost, or the holes distorted. Make and Calibre of Movement: With this information your WMJDA wholesaler can determine whether he may have genuine hands in stock for a particular movement. However, you must include all the other information listed above, even for genuine hands, in order for your WMJDA wholesaler to make the proper selection. Dial Diameter: Dial diameter, for hand selecting purposes, is measured in millimeters from the outside of the minute track on the one side of the dial to the outside of the minute track on the other side of the dial. Here again the sliding millimeter gauge is the handiest tool to use. Be sure and specify that this measurement is the dial diameter overall, and not just the length of the minute hand. 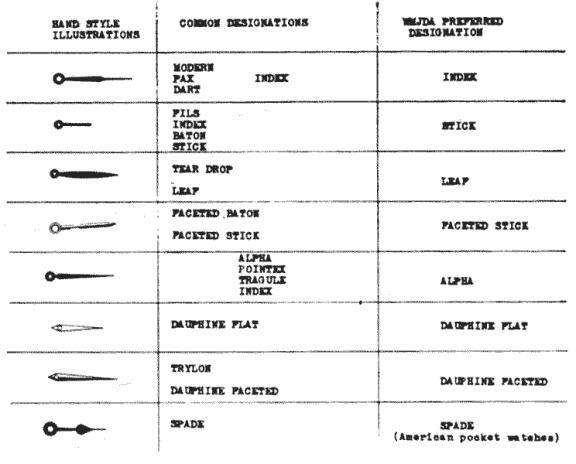 Style of Hand: Consult the chart in this section and see whether the style of hand you need is illustrated there. If it is, designate the style on your order using the WMJDA preferred designation. If the style of hand you need is not illustrated, draw a picture or send sample. To avoid a matching charge, do not send samples unless absolutely necessary. Color: Specify blue, white, yellow, etc. Plain or Radium: Specify whether the hands you need are for a plain dial, or for a radium (luminous) dial. Specimen Order: Here is a typical order for hands, incorporating the basic elements outlined above: 1 pr. hands AS 1194; Hour 1.32, minute .85; Dial 22mm overall; alpha white radium. A hand order like this will be filled correctly the first time by your WMJDA wholesaler. Miscellaneous Notes on Hands: Order hour and minute hands by pairs only. Your customer will immediately notice the color difference between the old and the new if you replace only one hand. For your convenience, all genuine hands and many metric assortment hands are packaged in pairs. Maintain a good working stock of basic land styles at your bench. Time spent in ordering and waiting for a special pair of lands isn't making money for you. Stocking hands enables you to take advantage of quantity discounts that will lower your unit material cost. Your WMJDA wholesaler sales representative will be happy to suggest the right hand system for you. THERE is NO ONE perfect and foolproof way of obtaining the watch crystals you need the first time every time. A startling statement, perhaps, but true, and it should be the starting point for our discussion of watch crystal ordering. The reason this situation exists is that the profusion of new watch cases hitting the market within a given time period simply outruns the ability of the crystal manufacturers and watch companies to pro- duce and catalog crystals for these new cases. Cataloging is an expensive business and must be carried out on an economic basis. This means that enough new crystal numbers must be assembled to make the printing of a new catalog or sheet at least a break-even proposition for the manufacturer. It is inevitable that requests for new crystals will always precede adequate supply and availability of information on these new, numbers. This is a situation that will not be easily or quickly remedied, and for the benefit of our ulcers we should learn to live with it. Round Crystals No Problem: The great bulk of watch crystals being replaced today are the round waterproof types, and since they present few problems of ordering or stocking we will pass on immediately to the more troublesome area of odd-shaped or "fancy" crystals. Fancy Crystals: Most fancy crystals are available in systems put out by the following well-known crystal manufacturers: Germanow-Simon, Standard Unbreakable, Electro-Seal, Federal, or American Perfit. Selection of crystals from these systems is outlined in the crystal catalog of the respective manufacturer. Genuine Crystals: There has been a trend on the part of some watch companies in recent years to make genuine crystals available for their cases. These crystals are sometimes available by the name of the case style, but more often by the case num-her. The idea of furnishing crystals by case number has great appeal for the watchmaker because of its apparent simplicity and many of the crystal manufacturers have jumped on the bandwagon and furnished a list of case numbers that are cross-referenced to crystals already in their cabinet assortments. These lists have proven to be a great boon for the W'MJDA wholesaler, who is faced with the prospect of proliferating "genuine" crystals on top of those of identical measurement already in his inventory. Problems With Genuine Crystals: While the system of ordering and supplying genuine crystals by case number is excellent in theory, it is less than a total success in actual practice because of the "communications gap" outlined in the first paragraph of this section. Very often your WMJDA wholesaler will have no reference whatsoever to a given case number, either in factory lists or cabinet assortment catalogs. In this event, he has no alternative but to ask for the watch bezel, to which he is usually able to fit a crystal from stock. Fitting Crystals to Bezels: When sending watch bezels for crystal fitting, you could assist your WMJDA wholesaler by removing the band or strap. Most bezels can then be put in a tin can and sent both ways in a First Class Mail "HAND STAMP" envelope. Bezels with bands or straps attached almost always have to be packed in a box and sent via slow Third Class Mail (Insured), or expensive United Parcel Service. Don't Send Complete Watches: Your WMJDA wholesaler requests that you not send complete watches for crystal fitting unless the watch is of a type requiring both movement and case together for a satisfactory fit. Otherwise keep the movements at home and minimize the danger of loss or damage in the mails. Hunting Case Crystals: When bezels fitted with hunting case or "Geneva" crystals are returned to you, do not replace the bezel on the watch and close the cover until you have checked the inside of the cover for dents. Such dents are often difficult to detect, but they will crack the new crystal the first time the cover is closed. A wooden dent remover is a "must" tool for every watchmaker. Does It Pay to Stock Crystals? A word about the economics of stocking watch crystals: Every owner of a crystal system has at one time or another wondered whether it really paid him to stock all those crystals, especially when he can point to many crystals that were in the cabinet when he bought it and have never been used. The key question here is not how many of the original crystals remain. The purchase of any kind of a system is a gamble, and there are bound to be certain numbers that move faster than others, and some that may not move at all in a particular area. The key question is how many times in a year are you "turning" your inventory, to borrow a term from accounting. If you are buying refills, this means you are selling crystals, and selling them at probably the highest percentage markup of any item you handle, with a minimum of labor and handling cost. 500% markup would be a conservative estimate. It should be obvious then that the stocking and fitting of crystals from a cabinet assortment is indeed a highly profitable part of the watch repair enterprise, in spite of the investment required. Old systems should be rejuvenated by the addition of "supplements" and new systems purchased when necessary, in order to have an up-to-date assortment at your fingertips. THE NUMBER OF WATCHES employing the two-piece male and female stem sys-tem is growing rapidly and proving to be a headache for watchmakers and wholesalers alike. TWO-PIECE STEMS ESSENTIALLY CASE MATERIAL: While the conventional threaded stem may be ordered by movement caliber alone, the two-piece stem must be ordered by caliber and measurement, since the length of the shoulder(s)-is dependent on the style of case with which it is used. If this basic distinction is kept in mind, you should have very little trouble ordering and obtaining the proper two-piece stem combination from your WMJDA wholesaler. MALE CROWNS, CROWN NECKS, EXTERIOR THREADED POSTS: When first introduced, two-piece stem combinations used a female split stem on the movement end, with a crown neck of a specific length and a male-thread waterproof crown. These combinations are seldom encountered today, having been displaced by exterior threaded posts used with conventional female-thread waterproof crowns. Exterior threaded posts are an item that every watchmaker should have in stock in taps 10 and 8, long and short length. They may be cut to length for a particular job, and are tremendous time and irritation savers. MOVEMENT CALIBER NUMBER NOT SUFFICIENT: Many watch models call for more than one length of movement-end stem, because of different case designs using the same movement. When ordering movement-end stems, you must specify the caliber of the movement and the overall length of the stem, measuring from the tip of the pilot to the end of the shoulder. This measurement should be in millimeters and accurate to I/10th. Do not send sample unless absolutely necessary. 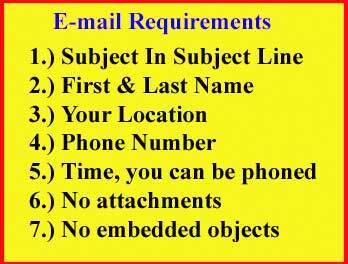 This information should be adequate for your WMJDA wholesaler to fill your order correctly. TWO-PIECE STEM KITS: Some watch manufacturers who employ two-piece stems extensively have made kits of these parts available to the watchmaker at a very reasonable price. Using various combinations included in the kit, the watchmaker can figure out the respective lengths of movement-end and crown-end two-piece stems needed for a particular job. When a piece of material from a kit is used, it should be re-ordered immediately so that it will be on hand when the next need arises. See your WMJDA wholesaler salesman for information on two-piece stem kits. Shape: Round, which are by far the most common, rectangular, and square. Profile: Flat or "0" ring. Material: Plastic, rubber, or lead. Gasket Assortments: You will never be able to stock every possible type of gasket for which you may have a call but your WMJDA wholesaler suggests that the purchase and maintenance of the following three basic assortments will solve the lion's share of your gasket problems: Otto Frei-type envelope system, including round flat, round "0" ring, and rectangular flat; Genuine Omega gasket assortment; Genuine Bulova gasket kit—presently available only in combination with certain numbers of waterproof crowns. With these assortments and your sliding millimeter gauge, most gasket replacement problems will become a simple matter of measuring the outside diameter of the gasket slot, consulting the assortment chart for the gasket number nearest the measurement, and inserting the new gasket. The Otto Frei-type assortment contains practically every conceivable size of round-flat plastic gaskets, and is used in a larger version by many WMJDA wholesalers as a master system. Refills are always readily available. Genuine Omega gaskets, especially the round "0" ring types, are extremely useful as replacements for worn or lost gaskets on Omega snap-back waterproof cases. Omega gaskets may also be ordered from your WMJDA wholesaler by case number. The Bulova assortment is almost indispensable because it contains certain styles exclusive to Bulova watches, and frequently used. Among these are the popular "centered-loop" and "offset-loop' styles. Since Bulova gaskets are not yet available in case numbers, it is helpful to have as wide a selection as possible at your fingertips. If the particular Bulova gasket you need is not in the assortment, order by movement model number, outside diameter of gasket slot, and description of profile or- any special features. Your WMJDA wholesaler should be able to fill your order from this information. Elgin Gaskets: Elgin gaskets may be ordered from your WMJDA wholesaler by case number. Information on gaskets, crowns, and hands is contained in the excellent Elgin case components manual. Hamilton Gaskets: Hamilton gaskets are listed by dimension in the Hamilton parts catalog. Measure slot with sliding milli meter gauge and order gasket by Hamilton part number. Omega Case Clamps: Omega case clamps are by far the most frequently ordered, and therefore we shall devote a special section to them. Assuming that one of the case clamps remains in the watch to be used as a sample, remove it and measure its lengthy and width to I/100th millimeter. Jot down these measurements. Then turn to the section of your material catalog in which Omega case clamps are illustrated. Match up your sample with one of the pictures, being absolutely certain that both shape and dimensions correspond. With each illustration you will find two numbers, the Omega factory part number, and the system position number. Order by specifying the system position number. Do not use the Omega factory part number. The reason for this is that there is so much duplication and confusion in the factory numbers that your WMJDA wholesaler could not possibly fill your order correctly. You will see by studying the Omega case clamp section in your catalog, for example, that at least eighteen different Omega case clamps carry the number 1911. An assortment of Omega case clamps is not expensive, and will pay back its cost many times over in valuable time saved. See your WMJDA wholesaler representative for details. Other Case Clamps: For case clamps other than Omega, order by movement model number and sample. Do not send the sample without the movement model number. Your WMJDA wholesaler should be able to fill your order with this information. OUR ARTICLES thus far have dealt with the proper ordering of Case Materially crowns, hands, crystals, two-piece stems gaskets, etc. We have tried to emphasize in each article that case material is distinctly separate from movement material, and that for the most part it must be ordered without reference to movement caliber number. Exceptions to this rule were duly noted within the individual articles. Now we are ready to take up the subject of proper ordering techniques for movement material. The main lesson learned in our discussion of case material, namely that there is a tremendous variety available for~>e any given watch, also applies to movement material. What we are saying is that movement model or caliber number is not sufficient information for your WMJDA wholesaler to fill your order correctly the first time. We can state without fear of contradiction that there has never been a watch movement marketed under a given calibet number that did not contain part variations within the caliber. Every watchmaker has had the experience of having ordered a part by caliber number only, and having been informed by his material supplier that more specific information was needed, because the particular part was available in several different varieties. In this article we are attempting to point out the most common problem areas. We urge watchmakers to make a conscious effort to memorize them, and to automatically supply the necessary information on each and every order. In this way costly and time-consuming requests for additional information can be avoided, and promised jobs can be delivered on schedule. Height: Due to differences of dial curvature, the following parts are invariably made in different heights for the same movement: cannon pinion, hour-wheel, and (weep second pinion or wheel and pinion combination. Get into the habit of automatically including height measurements when ordering these parts. Use your dial gauge, if you own one, measuring to I/100th millimeter. If you cannot give a measurement to I/100th millimeter, a measurement with your sliding Boley gauge to I/10th milli-meter is better than none at all. Never order cannon pinions, hour wheels, or sweep second pinions without specifying overall height. Pivot profile: Movements carrying the same model number are usually available with different train jewel arrangements. Capped jewels in the power train usually indicate conical pivots. You must specify straight pivots or conical pivots on your orders for the following parts: escape wheel, third wheel, fourth wheel, and pallet arbor. You must also specify the profile of both upper and lower pivot, using the following format which has gained general acceptance in the trade: S/S—both pivots straight, C/'S—upper pivot conical, S/C—lower pivot conical, or C/C—both pivots conical. A word of caution here. To determine actual pivot profile, remove the part from-the movement and examine it under the loupe. Many movements being marketed today carry false cap jewels, and the pivots they cover are actually straight. A good ex-ample of the importance for specifying pivot profile on your orders is the very popular Bulova SAD movement. This movement is made in 17, 21, and 23 jewel movements, and the third wheels are different. You must specify pivot profile to obtain this part correctly the first time you order. Regulators: specify whether for flat or brequet hairspring. Rollers: specify regular or shock protected. They are not the same. Mainsprings: specify end style. This is especially important when ordering mainsprings for Longines, Wittnauer, or Le Coultre models which list both tongue and tee ends for the same model. Take the spring out of the barrel and look at it. Also, when ordering automatic watch main springs by measurement, specify bridle end, so that your WMJDA wholesaler can send you the correct spring the first time. Balances complete—give following information: flat or brequet, regular or shock (if shock, specify type), beats per hour (BPH). This is very important today with more and more fast beat movements in the market place. Also screw-type or screwless. Balance staffs: It is a rare model indeed that does not list more than one balance staff. 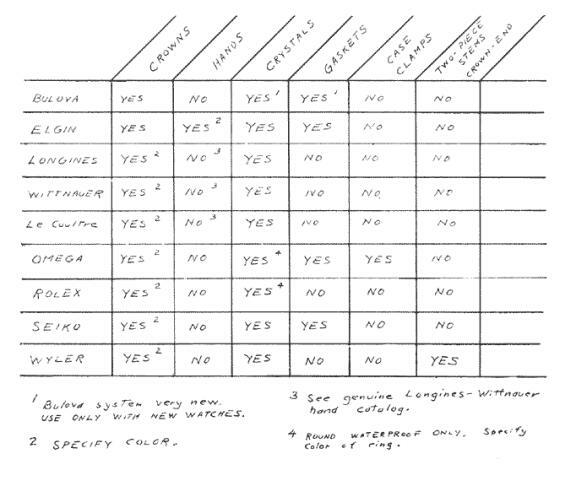 The following factors all enter in to your choice of the proper staff for a given model: regular or shock. If shock, consult your material encyclopedia to determine exact type. All collet diameter, roller shoulder diameter, and balance shoulder diameter to I/100th millimeter, friction or rivet, and screw-type, or screwless balance. After coordinating all of the above factors, select the proper staff from the listing in your material encyclopedia, and order from your WMJDA wholesaler by system number. Be particularly careful when ordering balance staffs for Jules Racine timers 3364 or 3364R. These models use a great variety of staffs, and model number alone is not sufficient. Use the factors listed above to •make a selection from your material encyclopedia, or send the sample staff with the model number to your WMJUA wholesaler. 3e prepared to pay a matching charge to artificially offset the wholesaler's added expense of filling an order to sample. Most WMJDA wholesalers consider the sealed V4 dozen package as the minimum order quantity for staffs and stems. They will usually make an exception, however, for models that are obviously obsolete or extremely slow moving. Due to the limitations of space we must necessarily confine ourselves to hitting the high spots in a discussion of this sort. Many problem areas have gone unmentioned in order that we may devote maximum attention to those which cost watchmakers the most in terms of down time on repairs. Next month we will delve more deeply into the area of movement material with a discussion of shock system components, a nightmare for watchmakers and material suppliers alike. FOR MANY YEARS the proper ordering of shock system components has been a thorn in the flesh of both watchmakers and material suppliers alike. The situation today is more confused and muddled than ever before, due to the continuing influx of cheap movements employing new and unnecessarily complex shock mechanisms. The good old days of only a few standard shock mechanisms are seemingly gone forever, and we must now somehow learn to cope with the jungle that confronts us. With some few exceptions, we may state that shock material must not be ordered by movement caliber number alone. The only exceptions to this rule, as far as we are able to tell, are Bulova (including Cara-velle), Elgin, and Hamilton. These three factories have done an excellent job of cataloging their shock parts by caliber number, and you may be reasonably sure of getting what you need by specifying both part am caliber. With (he exception of these three factories, watch manufacturers and importers in general have tended to sweep the issue under the rug and hoped that it would go away. This lack of provision for the orderly distribution of shock parts by caliber number is bearing bitter fruit for many of these same manufacturers and importers today. In view of the mass marketing o: cheap timepieces through outlets other than the retail jeweler, it is natural that the jeweler should want to sell watches not only superior in quality to those generally available through mass outlets, but watches that are easily and economically serviceable. Service is the sine qua non of the retail jeweler's market mix. Without it, he could not survive for one hour against the mass merchandisers. For advice on choosing lines of watches that are easily and economically serviceable, the jeweler is turning more and more to his "expert in residence," the watch-maker. If the watchmaker says that parts for a certain brand of watches are not readily and easily obtainable, the jeweler will surely want to think twice before saddling his already overburdened watchmaker with the added problem of trying to order parts without sufficient information. Availability of shock-system components by caliber number is a reliable indication that the manufacturer or importer in question is concerned about and has taken steps to provide orderly distribution of parts with a minimum of guesswork. 1—Using the shape of the springs as a guide, determine the name of the shock mechanism (Incabloc, Kif, Duofix, etc.). 2—Determine the specific size and shape you are looking for within the larger category. Within the category Incabloc, for example, there are many, many different springs, jewels, settings available. Select the one you need by comparison of illustrations and measurements. 3—After narrowing down the many possibilities to one choice only, order by the MASTER SYSTEM NUMBER and POSITION NUMBER. These numbers appear next to the factory part number in the encyclopedia and are keyed to your supplier's system. Using these numbers makes it possible for him to send you what you ordered with a minimum of delay and error. If the shock system you heed parts for is very new and not listed in the encyclopedia, send the intact shock setting to your WMJDA wholesaler for identification. Sometimes the upper and lower settings are different within a given movement, but identification of the general type is the first approach towards getting off of dead center. The industry-wide acceptance of ultra- sonic cleaning and widespread use of the Bergeon and Obama automatic oilers, for oiling assembled jewels have considerably reduced the necessity for disassembling shock mechanisms. Extremely dirty settings must still be taken apart and pegged, how- ever, and even the steadiest watchmaker will occasionally "Hip" a spring or jewel. Your WMJDA wholesaler suggests that at exasperating times like these you will welcome an assortment of shock components at your fingertips. The best way to build up a practical assortment is to purchase shock able to components in 1/4 dozen lots, and the chances are good that you will be help yourself when an emergency arises. Clock Springs: Order by measurement and description of end style (hole-end, loop end, open loop, tongue, etc.). Measure width in inches (to l/64th, if necessary). Measure strength (thickness) in thousands of an inch with inch micrometer. Measure length in inches. Inch measurements are preferred for clock springs, but millimeter measurements are acceptable. Please specify which system you are using. If sending sample, please clean spring before sending. Also, be pre-pared to pay matching charge for samples. Do not send sample springs in barrels. Your WMJDA wholesaler must make an additional charge for removing spring from barrel. Clock Keys: Order clock keys by description (single-end, double-end, etc.) and hole size. Catalog number is helpful (specify which catalog you are using). Measure square of arbor to I/10th milli-meter with vernier of sliding millimeter gauge. Order key with hole size 2/lOth's millimeter larger than square of arbor. Clock Glasses: For ordinary round con-vex or round flat glasses, order by diameter to l/16th inch. For other glasses give measurement, shape, material (glass 4 plastic), and name and model number o] clock. Dials: Specify diameter in inches (from outside of minute track on one side to outside of minute track on other side). Also, whether dial should have Arabic or Roman numerals. Hands: Most older American clocks use a standard hour hand hole size. However, you must specify whether the minute hand has a square hole (pendulum escapement) or oblong hole (lever escapement). Order proper length by specifying diameter of dial (actual length of minute hand' would be one-half of dial diameter). Specify style of hand (spade, maltese, or other). Replacement hands are generally avail-able only in blue steel color. Your WMJDA wholesaler suggests that you replace hands in pairs in order to avoid sharp color contrasts. For hands other than standard American hole size your WMJDA wholesaler requests that you order by sample, also give the name and model number of the clock, if possible. Give your WMJDA wholesaler permission to special-order the hands for you if he does not have them in stock. Pendulums: When the pendulum is missing from the clock the best procedure is to check your WMJDA wholesaler's catalog to see whether a pendulum is listed for the particular clock (e.g. New Haven, Gilbert, Seth Thomas Adamantine, etc.). If there is no specific listing for the clock, 'your best course is to order a standard adjustment pendulum ball. These are available for both 8 day and 1 day clocks, and your WMJDA wholesaler suggests that you keep one of each on hand at all times. Suspension Springs: French clock-type suspension springs should be ordered by catalog number by comparing the spring with the illustrations of these springs in your WMJDA wholesaler's catalog. Take care to match the picture as closely as possible to the actual spring. If you cannot find a listing of the spring you need your WMJDA wholesaler suggests that you order a piece of flat spring steel of the proper gauge and disassemble the brass holding plates, and replace the broken portion of the spring. Unfortunately there is no formula for determining the proper spring if the sample is missing from the clock. Verges: Within the past few years complete replacement verges have again appeared on the market and are being stocked by most WMJDA wholesalers. Order by sample and name of clock. Verge components are also available in kits at a much lower price. Discontinued and Unavailable Clock Parts: Replacement parts for obsolete clocks are almost impossible to obtain with the exception of those standardized parts listed above. As a general rule do not order by the name of the clock since the factories have been out of business for many years and parts are not available. Most WMJDA wholesalers are not able to supply items like train wheels. Your best source for wheels and other difficult parts would be a local clock repairman, or a collector having a stock of used clock movements. Cuckoo Bellows: Specify length and whether bellows has back opening or side opening. Cuckoo Chain: Order by catalog number if your catalog shows the number of links per foot. Otherwise order by sample. If chains are missing entirely, send chain wheel. Please remember that cuckoo chains are sold only by the pair. Cuckoo Chain Wheels: Order by sample. Give your WMJDA wholesaler permission to try and obtain the wheel on a special order, if necessary. Cuckoo Weights: This is a problem only when both weights are missing. There is no alternative here but to try various weights until you find the right combination for the particular clock. Cuckoo Hands: Cuckoo hands are ordered by the length of the minute hand in millimeters and measured from the center of the hole to the tip. Compare this K standard American clock hands which are measured by overall dial diameter in inches Specify whether small hole, large hole, 01 brass bushing minute. Suggestion: small holes are usually the wiser choice because they may be filed larger to fit a particular post. AN INVALUABLE AID in the identification and servicing of 400 day clocks is The Horolovar 400-Day Clock Repair Guide, published by the Horolovar Company and available from your WMJDA wholesaler. This book is a worthwhile purchase. 400 DAY SUSPENSION SPRINGS: Order by strength—thickness. This dimension may be given in thousandths of an inch or hundredths of a millimeter; either is acceptable. The most important thing is that the measurement be exact. The slightest variation in the strength of the spring will make a large variation in the timing of the clock. To be absolutely sure, your WMJDA wholesaler suggests that you measure three times before ordering. Send sample only if necessary, and be prepared to pay sample matching charge. HOOK AND FORKS: Match up with picture in catalog and order by catalog number. COMPLETE SUSPENSION ASSEM-BLIES: Identify clock by comparing with plate illustrations in Horolovar book. Careful! Many similarities. Order by number in book, but give your WMJDA wholesaler permission to special-order, if necessary. The first thing to remember is that the name on the dial and plates is absolutely meaningless when ordering parts for most travel clocks. Check your material catalog for an illustration of the clock plates. If they are shown, you can at least identify the caliber of the movement. If the individual parts are shown, match up your sample with the picture and order by part number and position number. If the part you need is not shown, but you have been able to identify the movement, specify the movement caliber and order by sample. If you cannot identify the movement readily, send both the movement and the sample to your WMJDA wholesaler, with the sample removed from the movement. TRAVEL CLOCK CASE MATERIAL: Travel clock case material is not standard sized, and is therefore not available to movement or clock model number. Westclox is an exception. Your WMJDA wholesaler suggests that you stock the following parts in assortments so that they are instantly at hand when the need arises: threaded winding keys, thread and friction setting buttons, and bell screws. This small investment could save many a precious minute of your time. Write down the name and model number of the clock. This information will be found on the case. Locate the name and model number in the index of the latest Westclock catalog. If you need movement parts, refer to the page showing the basic movement- for the clock in question. Westclox uses a few basic movements in many different styles of cases. Order movement parts by name of clock, model number, and Westclox part number. If you need case parts, refer to the catalog page on which the complete clock is illustrated. Case parts will be listed on that page. Again, order by name of clock, model number, and Westclox part number. MISCELLANEOUS NOTES ON WESTCLOX: If clock is unusual or very new, give your WMJDA wholesaler per- mission to special-order the parts for you. Be especially careful when ordering parts for Baby Ben model 61Y. The original 61Y used the old two-spring Baby Ben movement, but the newer 6lYs use the Model 77 single-spring movement. Be sure and specify. Westclox is currently using many imported movements in their travel clocks. Please do .not order "part to sample for Westclox travel clock". If you cannot identify the movement, send the movement and sample to your WMJDA wholesaler, with the sample removed from the movement. For clock motors that are not really identifiable or listed by number in your catalog, send the sample to your WMJDA wholesaler, with permission to special-order, if necessary. Try not to quote definite prices to your customer ahead-of-time, because very often the unusual clock motors are high priced, and you might find yourself barely breaking even OB the job. Also, some of the older motors are simply not available from any source. COMMON OR OFTEN-USED CASES: These cases are readily available from your WMJDA wholesaler's stock, and include the 10½-11½ ligne stainless steel and chrome screw-back water resistant cases in various dial openings for stem-wind movements, and the 6% x 8 ligne ladies snap-back cases. The latter are usually available in case, dial, hand and crown combinations and are designated as FHF 60. These common cases may be obtained by stating the size of the movement, the dial opening, color and quality, for round water-resistant cases, or the shape of the dial opening, color and quality for 6% x 8 ligne. 6% x 8 L case, crown, dial and hand combination in yellow and white RGP with universal or "cushion-shape" dial opening. CASES FOR SELF-WINDING WATCHES: Most WMJDA wholesalers stock stainless water-resistant cases for the more popular self-winding movements. However, dial openings are a problem, and it is suggested that you order self-winding cases by sending in the movement. Always be sure to tell your WMJDA wholesaler whether he has your permission to order a case to your movement, if he does not stock the case you need. This will save several days time in the ordering process. Some self-winding movements are "closed" calibers marketed only by certain watch manufacturers—Bulova, Elgin, Longines-Wittnauer, Omega, Rolex, etc.—and cases for these movements are usually avail-able only direct from the manufacturer. However, to save time it is a good idea to inquire of your WMJDA wholesaler before ordering direct from the manufacturer. SQUARE AND RECTANGULAR CASES: Almost invariably these must be ordered to the movement and dial. Very often the movement itself will be round— e.g. the popular 8/0 size Elgin and Hamilton movements—but the dial and bezel rectangular. It is the best practice to order these cases by sending in both the movement and dial, and at the same time give your WMJDA wholesaler permission to order the case since it will very likely not be in his stock. POCKET WATCH CASES: Availability of new replacement pocket watch cases is pretty much limited to open-face chrome or gold plated cases in 12, 16, or 18 size. Original quality replacements are virtually unobtainable. Hunting cases, double back cases, karat gold cases, or unusual-size cases—e. g. for 16 size thin Howard—would have to be obtained, if at all, from collectors, gold scrap buyers, dealers in used movements, etc. OBSOLETE MOVEMENT SHAPES AND SIZES: Many wristwatch movements produced in Switzerland in the 1920s and 1930s were of unusual shape and size. Replacement cases for these movements are practically impossible to obtain through normal sources. By the same token, many of these movements were set in gold or platinum and mounted with precious stones, and the owners would like to find replacement movements in good condition. Once in a great while such a movement may be obtained from a dealer in used movements, but most WMJDA wholesalers are not in a position to obtain such movements. EXCLUSIVE CASES: These are cases available only from the manufacturer of the watch. This problem is also treated above as it relates to certain cases for self-winding watches. The following special-design cases would fall into this "exclusive" category, to mention just a few: one-piece cases—Benrus, Wyler, Bulova, Longines-Wittnauer, etc.—rectangular water-resistant cases requiring screws—Elgin, Croton, etc.—Hamilton CLD, and direct reading watches. The matter of customer pride also falls into this category. Most owners of "prestige" watches would not accept less than genuine Factory cases even if satisfactory substitutes were available. QUALITY AND COLOR: Always specify the quality and color of the case you are ordering. Qualities are: all stainless steel, chrome with stainless back, all chrome —usually pocket watch—rolled gold plate, 20 micron gold plate, 1/20 12 karat gold filled, and karat gold. The latter two are relatively rare in replacement cases, and it is good practice to specify an alternate quality for your WMJDA wholesaler when ordering one of these. THERE is A CONTINUING DEMAND for replacement parts for obsolete watches, and parts for these watches are becoming scarcer by the day. Pocket watches are being taken out of storage and repaired by the thousands. Some are being displayed in domes or brass holders, and some, especially the smaller hunting case styles, are being worn as decorative timepieces. The current popularity of restoring "grandpa's watch" is rapidly draining the supply of replacement parts, and as the supply declines, prices are on the rise. At least part of the dilemma stems from the fact that many of the older American watches were extremely well made—one might say they were almost works of art— and with proper maintenance should run almost forever. Proper maintenance, however, includes occasional replacement of a worn or broken part, and the stocks of factory parts for most of these watches are exhausted. The Hampden, Howard, and Illinois watch factories went out of business in 1930, and South Bend in 1933. For almost forty years then watchmakers have been using up the stock of parts which these factories had on hand when they quit business, and the situation is now critical. In addition, Elgin has discontinued production of all parts below grade 532, and the stock of genuine Waltham parts is also becoming rapidly depleted. Some of the more popular parts for these watches, such as balance staffs and mainsprings, have been produced in imitation for many years, and will very likely continue to be available. There may even be additions to the line of imitation parts avail-able, such as certain popular setting and click springs, crown and ratchet wheels, etc. Imitation parts, however, are not a complete answer to the problem, because it will never be economically feasible for a manufacturer to tool up to reproduce all the parts even one particular watch model —e.g. the 16 size Illinois Bunn Special, a very popular and sought-after obsolete movement. More and more the skill of the individual watchmaker will be tested in the making of replacement parts for these obsolete watches, at a price to the consumer commensurate with the time and effort involved. Such lost arts as repivoting and gear cutting will again be practiced for profit. IDENTIFICATION OF MOVEMENTS: It stands to reason that one should first check out the possibility that an obsolete part may still be available before proceeding to such extreme measure as making one from scratch. To order parts, however, the movement must first be correctly identified, and herein lies a problem. Merely stating the name and size of the watch is usually not enough, since many models were made in each size, with each using its own distinct material. Ordering "one center wheel 12 size Waltham" or "one click 16 size Elgin" is not enough information for your WMJDA wholesaler. The best possible way to order obsolete parts is to send both the movement and the sample part to your WMJDA wholesaler, with the sample removed from the movement or balance wheel. As the saying goes, a picture is worth a thousand words, and you can save both yourself and your WM-JDA wholesaler much time by sending the movement and sample when ordering the first time. Alternative methods of identification may be used, but none is quite as certain as parts sending the movement and sample. If, of course you can find the movement illustrated in an old catalog, with a factory main-number assigned to the part you need, then order by name of watch, size, name of part, and factory number of the part. An excellent catalog illustration obsolete American movements is available from the E. & J. Swigart Company of Cincinnati, Ohio, an active member of WMJDA. SERIAL NUMBERS: The only watch company that maintained a truly comprehensive serial number listing up to the time that grade numbers were stamped on individual movements was Elgin. If the Elgin watch for which you need parts is not stamped with a grade number (three digits), order by size of Elgin watch, name of part needed, and serial number. Do not order these by serial number for watches other than Elgin. PRIVATE BRANDS: In years past it was quite common for local prestige jewelry stores to contract with watch factories to supply watches with their own store name on the dial and plates. These watches occasionally turn up for repair even today. If unable to identify, send movement and before sample part needed to your WMJDA wholesaler. OBSOLETE SWISS MOVEMENTS: Although parts for obsolete American movements are becoming very difficult to supply, at least the movements are for the most part identifiable and your WMJDA wholesaler knows what he is looking for. With obsolete Swiss, the situation is infinitely more complex. Many of the movements are hand-made and one-of-a-kind. For many of the movements that were machine-made, there is no catalog information available and the factories that produced them never made the slightest provision for orderly distribution of repair parts. As with obsolete American, the best way to order is to send the movement and sample with the sample removed from the movement or balance wheel. For the most part, even this is an exercise in futility, since the odds are very much against your WMJDA wholesaler's being able to obtain the part. CORRECT PART NAME: Consult your findings catalog for the proper designation of the part(s) you need. MANUFACTURER: Specify Fuller, Cobb, Newall, Grassman-Blake, etc. CATALOG NUMBER: Look up the part number in your findings catalog and order by the number. QUALITY: Findings are available in many different qualities. You must specify exactly what you want. "Fuller Quality" or "WRC Quality" means 1/40 Rolled Gold Plate. For karat gold items you must specify 10K or 14K. If low-end merchandise is de-sired, specify nickel or gold plate. Always check your findings catalog beforehand to see whether the item is available in the quality you want. COLOR: Gold filled is available in either yellow or white, as is karat gold. Check catalog to be sure on specific items. Sterling silver is always white. Nickel-plated is always white. Gold plate is always yellow. -Be sure and specify color for gold filled and karat gold items. FACTORY PACKAGES: Most findings come in standard factory packages. Because of the high cost of labor-all WMJDA wholesalers engage in interstate commerce and therefore must pay their employees the prevailing federal minimum wage - your WMJDA wholesaler must make an extra service charge when selling less than a standard package. This applies especially to fast-moving items like jump rings, spring rings, spring bars, etc. PRICES: Findings prices are based on a descending scale. In other words, any quality under a full unit-usually one dozen-is charged at a higher rate. Example: If an item is priced at $5.00 for a full dozen, 1/2 dozen would cost $2.75, 1/4 doz. would cost $1.50, and a single piece would cost 60 cents. Also, due to tremendous fluctuations in metal prices at the manufacturing level, catalog prices are often obsolete even a short time after a catalog has been published. We suggest that you allow for this contingency when quoting to your customers.